On March 23, 2018 the United States began charging a tariff of 25% on some imported steel and 10% on some imported aluminum. Structural Steel, Concrete Reinforcing Steel, Tanks, Ducts, Pipes, Metal Deck, Metal Roof Panels and Metal Wall Panels, to name a few of the major construction materials which will be potentially impacted by this tariff. The impact of this tariff on the cost of steel and aluminum for projects will vary based upon a project’s schedule and the contract bidding/delivery method utilized. While the near term prices will likely fluctuate with speculation and changes to the terms of the tariff, FSB looks to our country’s past experiences and the current industry to make our best estimation of the potential impacts. 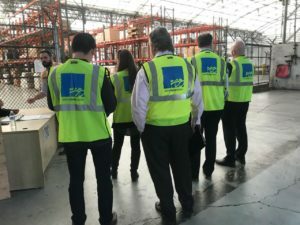 It is important to quickly note here that even concrete buildings have a significant amount of steel; approximately 75% to 85% of a structural steel building, on average – so this tariff potentially impacts all construction projects. Some of the challenges we face in predicting cost, is that this is a very dynamic market and there are many variables; not the least of which is our industry’s memory of the volatile steel prices approximately 10 years ago. Projects bidding in the immediate term will coincide with the initial period of the tariff, where uncertainty, anxiety and fear are at their highest. Projects which use a significant amount of steel may well be won and lost depending upon a contractor’s tolerance for risk; more so than any other single factor. And the amount of risk taken may adversely impact the overall success of projects if the risks do not pan out for the contractor. Even more so than in commercial construction, the federal government’s longer contracting period represents an increased risk to contractors bidding a federal project as they will be required to hold a large percentage of their bid (metals) on a fixed-price for an extended period of time, in a market which may be seeing significant increased costs. The Associated General Contractors of America (AGC) issued a memo on March 8, 2018 which encourages Federal Construction Contracts to include specific FAR references which help ease this risk. The AGC notes, “Since the federal government procures most construction contracts on a fixed-price basis without a contract price escalation clause, spikes in material prices for items such as steel and aluminum can represent a significant challenge for contractors. Federal Acquisition Regulation (FAR) subpart 16.203 specifically allows for economic price adjustments in fixed-price contracts. In order for it to assist a federal construction contractor, it reportedly must be implemented as part of our project’s contract through FAR parts 52.216-2, 3 or 4.” The implication is that this contract clause will eliminate bid contingencies and make for a fairer, more balanced bid or proposal process. The AGC has additional recommendations for non-federal contracts. The American Institute of Steel Construction (AISC) noted in a webinar on March 23, 2018 that in 2016 (the last year of available data) their membership reported ample production capacity, fabrication capacity and a 3 month on-hand supply of structural steel in warehouses. The total US steel-making capacity is 149 million tons annually and 101 million tons of steel were from US sources with 38 million tons imported – if this total demand was maintained and served only from the US, there would still be a reserve capacity of 11 million tons of steel production in the US. 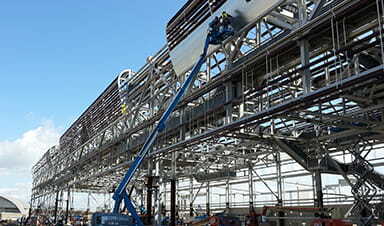 The total US structural steel fabrication capacity is 10 million tons annually and 6.3 million tons were from US sources with 1.7 million tons imported – if this total demand was maintained and served only from the US, there would still be a reserve domestic fabrication capacity of 2 million tons of structural steel. It is interesting to note here that two-thirds of the international sources for fabricated structural steel were from Canada and Mexico, which are both currently exempt from the tariff. The AISC’s information indicates there is not an anticipated shortage of structural steel (production or fabrication) in the US. While there are many reported reasons for the tariff, it is believed the intent of the tariff is to level the steel and aluminum marketplace in the US and to shift steel and aluminum production and fabrication back to US companies and workers. While the tariff does not apply directly to US steel, the pressure of cheaper, foreign steel and aluminum may lesson and result in an increase in the cost of domestically produced and fabricated steel and aluminum. In looking at the prior President Bush era steel tariffs in March 2002 through December of 2003, which varied as high as 30%, we saw approximately a 33% increase in US raw steel material costs which peaked six months following the start of the tariff and then dropped off in cost and averaged approximately 20% higher than the pre-tariff cost for the remainder of the tariff’s duration. Interestingly, the raw steel costs again increased for a long period of time after the tariff ended. This same data set (by SteelBenchmarker™) indicates the pre-2018 tariff cost of raw steel in the US is nearly $900 per ton as of March 1st – up from $800 per ton as of January 1st. FSB recently contacted one of the largest US fabricators and confirmed the January 1st cost of $800 per ton and was told the raw material cost has already increased to $1100 per ton at the onset of the tariff (an increase of 37.5% on raw material), with additional cost increases expected. Per AISC, the raw steel costs represent one-third of the total constructed steel cost. AISC did not report an expected corresponding increase in the fabrication, shipping or erection costs of structural steel. As such it could be estimated that the total increased in steel cost in a completed facility so far this year is approximately 12.5%. Previously, in 2002 we saw prices peak at 6 months before nearly halving for the duration of the tariff; which may indicate total erected steel costs would be less than a 10% premium by late 2018. As in 2002, we do not know how long the 2018 tariff will last, but in 2003 when the tariff ended, we note the price of steel again began to sharply rise in those economic conditions and its price decoupled from the cost of Chinese steel which remained at the lower cost. The key to successfully navigating projects during this tariff is having in-depth knowledge of the design of steel materials in construction, and continually monitoring the pulse of the industry and the status of the tariff in order to help building owners make the best possible project decisions. Please contact FSB at (405) 840-2931 to learn more about how our team of Architects and Professional Engineers can help lead your project down the path to success.